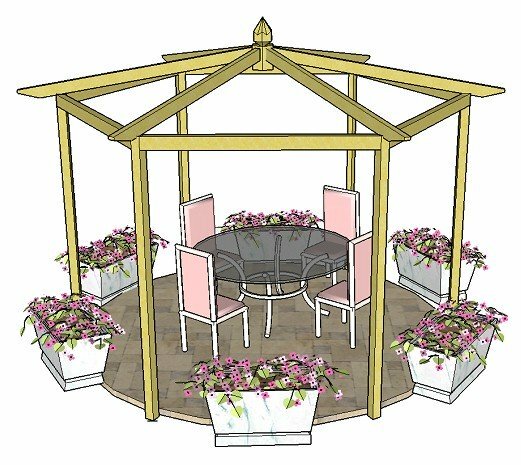 Can I Use the Free Step-by-Step Pergola Plans to Make a Romantic Wedding Bower? I was wondering if these pergolas are freestanding? I’m thinking of making one for my wedding indoors. Can it stay up without any anchoring? It’s not as if it will be windy inside! Also, I want to make it 7.5 feet high, 8 feet wide, and 3 feet deep. Any suggestions on how to do that? What a fabulous idea! I know the sort of thing you mean: like a wedding bower. So romantic! I'm assuming you are looking at the main pergola plans, which you will be able to make any size or shape, with measurements to fit your space. The plans are not a specific size. They are written so that you can build the size you want as you go along. 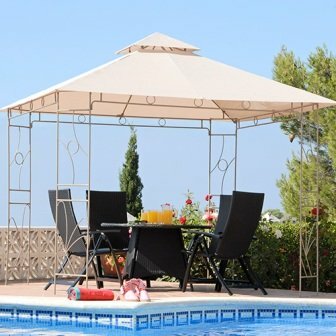 The simple pergola plans would also be ideal, and wouldn’t take very long to put together. Changing the shape of the rafter tail ends. 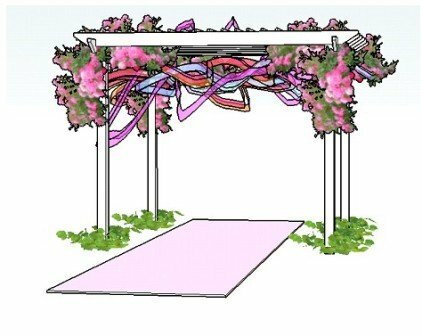 Painting your pergola to match your wedding theme. Adding interesting accessories like hanging trinkets and ribbons. Adding real or silk flowers to clamber over the rafters. 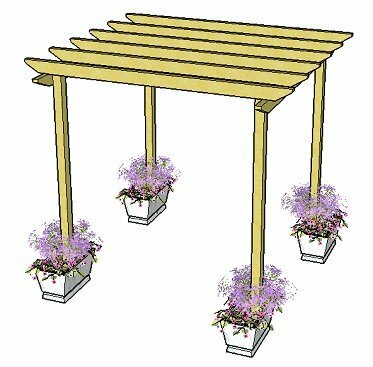 Assuming that you are looking at the main pergola plans, these are free standing and are easy to make. 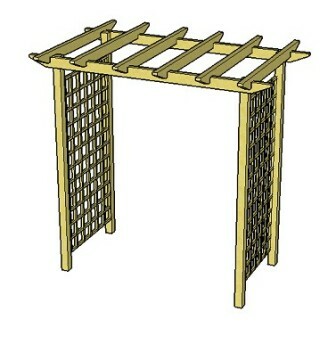 The pergola should stand on its own quite easily, if you feel it will be safely out of harms way. The only concern here would be, because the pergola will not be very deep (3ft), it will be less stable than a deeper pergola (8ft x 8ft) if someone leans on it, or if there are children playing near to it. I would always recommend having it secured to the ground by some means! An idea might be to build it on a run of decking boards (a cheap way of doing it as you won't need many), pushed right up together so that they don't move, and then use post anchors (in which the posts are placed) which are then screwed to the decking. This would be a very simple way of stabilising the structure. Paint or cover the anchors to disguise them to fit in with your theme. 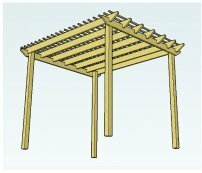 This method will give a slight step up (the thickness of the decking boards) into the pergola, which would act as a slight stage. 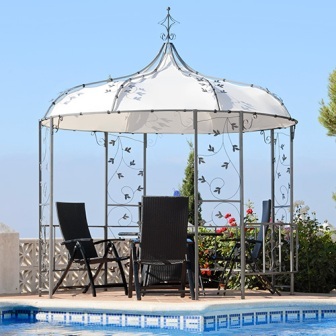 You could easily dismantle the pergola itself after the wedding and put it in your garden! Another option might be to stand the posts in pots and fill with a little concrete, then either fill the top of the pots with trailing plants or silk flowers. If you wanted to use the pergola in the garden afterwards, you would need to chip the concrete off the bottom of the posts first, or just buy new posts and rebuild. A good place to start would be to see how you are able to adapt the plans. This will give you a good idea of rafter styles and the different modifications you can make. I can imagine your pergola looking very like this pergola on my site, although yours will be slightly deeper. This one is 2' deep and has a raised rafter style. It can easily be made from the free plans, but there are some specifically for this pergola arch design. Just leave the trellis out if you don't want it, although it might give an added romantic feel to your wedding bower. Change the rafter tail end design to a curved style if you wish. You can find 18 designs, ready to use. 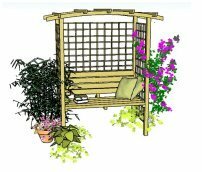 This style is taken from Pergola Design 2 of the simple pergola plans and shows the posts standing in pots. Of course, you could have any style of pot you liked, with a choice of fresh or silk flowers to fill the base. 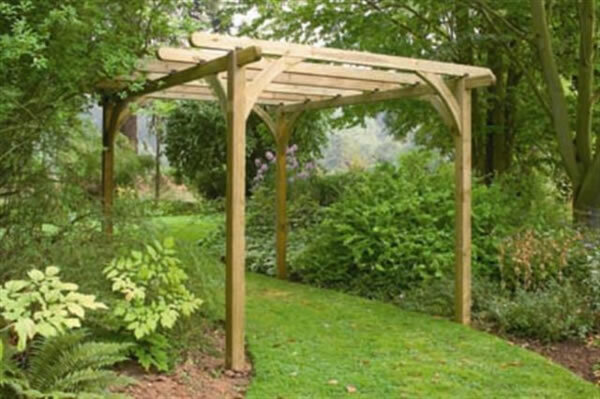 Alternatively, you could use a pergola kit, which may work out to be a bit more expensive, but again you could use it in your garden after the wedding. I'm sure your wedding bower will be absolutely beautiful! If you need any more help, please feel free to ask. Congratulations, and best wishes for the future!